Unlike many students working their way through college, Karis did not push the easy button when it came time to choose a job. 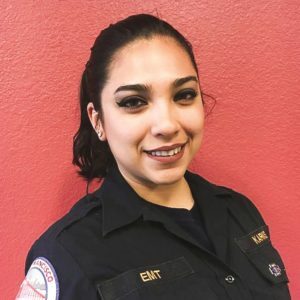 Not only did she decide to become an EMT while attending school, she also chose to work in AMR’s San Francisco operation, one of the busiest EMS systems in the state. On July 11, 2017, at around 8:30 p.m., Karis was completing paperwork inside the ambulance while parked outside a local Emergency Room. Suddenly, Karis observed a woman approaching quickly carrying a one-year-old child. The boy had choked on a piece of cantaloupe, and was not moving or talking. His lips had begun to turn blue. Karis’s training immediately kicked in. She jumped into action, moving first to back blows, then chest thrusts, and finally to finger sweeps, which ultimately dislodged the fruit. The child immediately took a deep breath, started crying, and regained his color. Karis said it was the most beautiful cry she had ever heard.